ITV today shared the sad news that Lila, a Bulldog puppy worth £16,000, who was stolen in October last year, is still missing. Although this case is unique in that this puppy is a rare lilac Bulldog and worth such an extraordinary amount of money, it is ultimately a part of an unfortunately growing trend of pet theft, particularly in the south east. Certain breeds are more widely targeted by thieves, usually due to their high street value. Bulldogs are one of the most expensive breeds to buy, which is part of what also makes them one of the most expensive breeds to insure. Unfortunately, the maximum payout for theft for most pet insurance policies is typically around £2,000. There are currently 66 Bulldogs reported missing in the UK, 12 of those in the South East. Of the last 5 reported thefts of bulldogs, 4 have been in the South East. Lila's story is particularly harrowing due to the level of violence involved when she was taken. 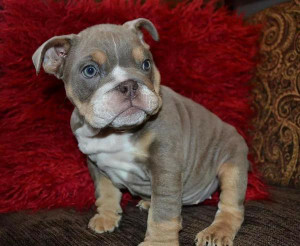 With such a high street value, due to her being the only tricolour lilac Bulldog puppy in the country at the moment, it is no wonder she was such a target for thieves, though still a sad and shocking case. We hope little Lila is found soon and returned to her rightful owner, and the same for all the other missing and lost dogs out there. "What I liked is that I was introduced to a company that I may not have generally come across, and I was able to get the best cover for a ..."
If you have any information which might help bring Lila home, please contact Surrey Police by calling 101, quoting reference number 45140087824, or Crimestoppers on 0800 555111.